Dual phenotypes. When KCNT1 was first described as a gene for Migrating Partial Seizures of Infancy in 2012, it wasn’t just a novel gene for epileptic encephalopathies. In parallel, the same gene was found to underlie a novel subtype of autosomal dominant nocturnal frontal lobe epilepsies (ADNFLE). At the time, this left us scratching our heads how a gene could cause such distinct, but entirely separate phenotypes. In a recent publication in Epilepsia, Møller and collaborators revisit the phenotypic spectrum of KCNT1. They find that both phenotypes can occur within a single family and that KCNT1 mutations can result in other phenotypes, adding to the mystery of KCNT1. Figure. Distribution of the KCNT1 mutations along the protein, demonstrating the clustering of mutations around the functional domains of the C-terminus. On the left side, a pedigree is shown where affected individuals have either nocturnal frontal lobe seizures or Malignant Migrating Focal Seizures of Infancy (non-copyrighted version of the figures provided by the author). Malignant Migrating Focal Seizures of Infancy (MMFSI). Prior to the discovery of KCNT1, MMFSI or MPSI was considered an extremely rare epilepsy syndrome. In contrast to the widespread electrographic abnormality seen in suppression-burst patterns or in hypsarrhythmia, MMFSI has migrating seizures as its key feature. While this was considered to be a relatively non-specific EEG phenotype, the discovery of KCNT1 has put new emphasis on this electroclinical syndrome. The KCNT1 gene is coding for a potassium channel that was initially thought not to be present in the CNS. However, the gene discovery made us rethink this notion. In their recent publication, Møller and collaborators report 12 new patients with KCNT1 mutations, providing one of the largest series on KCNT1 so far. Phenotypes. Møller and collaborators confirm the previous link between KCNT1 and both MMFSI and ADNFLE. While this phenotypic specificity might have been explained previously by mutation-specific functional consequences, the authors present a family where MMPSI and frontal lobe epilepsy run within the same family. This suggests that there is a broad range of phenotypes associated with a single mutation within KCNT1, resulting in a phenotypic spectrum that we currently don’t have a good explanation for. The authors also emphasize that all mutations reported so far are missense mutations, supporting the claim of the initial studies that these mutations are activating, leading to too much flow of potassium. Mutations. In the initial publication, Barcia and collaborators identified a recurrent mutation in KCNT1, which seemed to explain a large proportion of cases. While this initial recurrent mutation, p.Arg428Gln, was not confirmed as the major mutation in further studies, the p.Gly288Ser mutation emerged as the most common KCNT1 recurrent mutation, which was found in at least six patients. This mutation is located in one of the transmembrane regions and is somewhat of an outlier. Most reported MMFSI and ADNFLE mutations cluster around specific functional domains of the long intracellular C terminus, suggesting that regulation of this ion channel may be an important mechanism to target for therapy development. Quinidine. The old antiarrhythmic drug quinidine was found to inhibit the KCNT1 channel, counteracting the gain-of-function that was introduced by the mutation. 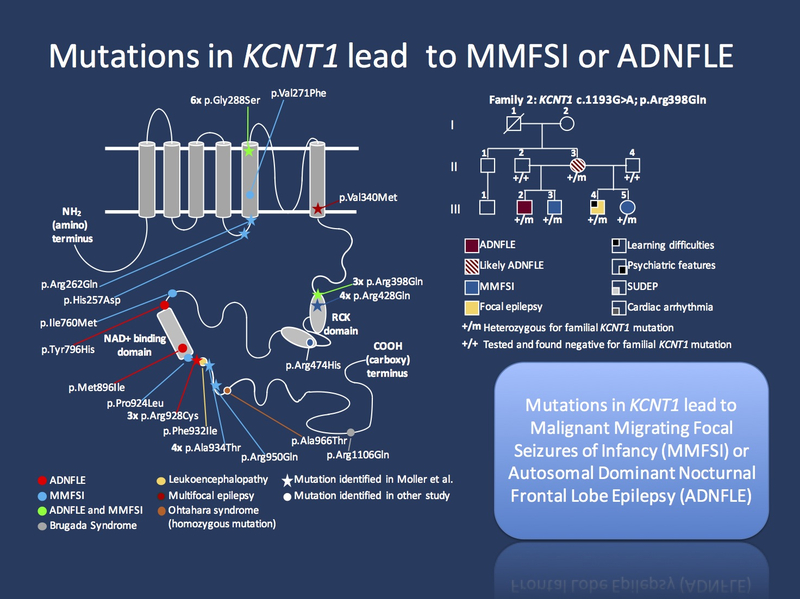 In 2014, a functional and a clinical publication could demonstrate that quinidine can be used for targeted treatment of MMFSI due to activating KCNT1 mutations, providing us with a successful example of precision medicine in epilepsy genetics. While larger studies on the effect of quinidine in KCNT1-mediated seizures are still in process, the quinidine story is a nice example of how genetic discovery can point towards existing drugs that can be used. Quinidine has been around for ages, but there was never any impetus to try it for seizures. Patient registry. At CHOP, we’re currently in the process of building a patient registry for KCNT1 patients, which will be directed by David Bearden and which is currently in the approval process. We have already approached many of the centers caring for patients with KCNT1 mutations and are already aware of 25 patients that may be part of the registry. If you are aware of additional KCNT1 patients, please let us know (email link). This is what you need to know. In 2015, KCNT1 is not getting any less mysterious. It remains a gene that causes a very rare, but distinct catastrophic epilepsy of childhood. In addition, the very same mutations can result in a severe from of frontal lobe epilepsy with prominent psychiatric features. Several mutation hotspots and recurrent mutations in KCNT1 are emerging, most prominently the clustering around the functional domains of the intracellular C-terminus and the recurrent p.Gly288Ser mutation. This entry was posted in 2015, Epileptic encephalopathy, Familial epilepsies, ILAE Genetics Commission, Papers and tagged ADNFLE, CHRNA2, CHRNA4, CHRNB2, frontal lobe epilepsy, KCNT1, Malignant Migrating Partial Seizures of Infancy, MMFSI, MPSI, QARS, SCN1A, SLC25A22. Bookmark the permalink.